Given the current focus on digital transformation, companies are experiencing mounting pressure to modernize datacenters and cloud-based infrastructure, and to implement more agile processes. Moving to a modern datacenter can help your organization remain competitive and relevant, but it isn't easy. Manual processes, a lack of control, separate infrastructure, and inefficient deployment can make it difficult. Red Hat® Virtualization can help. It’s an open software-defined, easy-to-use, efficient infrastructure and centralized management platform for virtualized workloads. 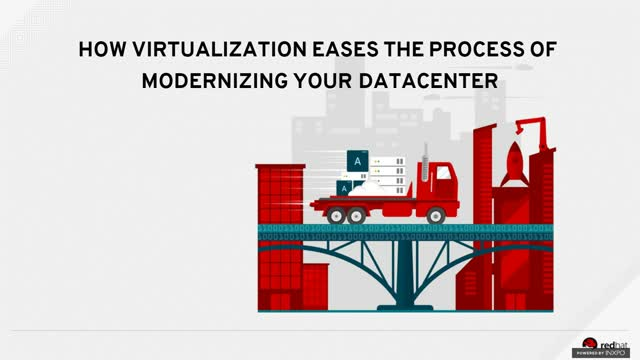 Built on Red Hat Enterprise Linux® and Kernel-based Virtual Machine (KVM) technologies, Red Hat Virtualization offers a high-performing, highly-available platform that helps businesses have a stable infrastructure that easily scales. > Red Hat Virtualization features, use cases, integrations, and partners, which allow you to build a streamlined, reliable environment with mixed workloads. > Virtual-to-virtual (V2V) conversion tooling, helping you more easily migrate workloads from other hypervisors.